Grandfathered:duim: But if you want to be ”up-to-snuff” so to speak then making the changes would be your choice. Kind of figured this would be the case. The ears just happened to be something Tony noticed when I submitted for Centurion but not EI. I do plan on making the adjustments though. “ L1: There should be a visible gap between the brow trim and eyes. L2: A gap of approximately 5mm to 10mm must be present between the brow trim and eyes. Question: does that mean it can’t be more than 10? Good question. I was thinking of a max to stop people going way high, like the move along trooper, as I’m not aware of a TK with a brow that high. Now I feel the urge to measure my brow. I fully agree with that mate. My adjustments will be made entirely off suggestions from the DO staff made during my reviews. Thankfully my stripes and return edges are up to snuff now. Hahahaha! How about a slightly crooked one for the TK that spent too much time at the imperial bar last night while off duty. Almost all of these are already being asked of applicants so I don't see why we can't start adding them - officially - to the CRLs (for Centurion I assume?). stay for Matt's and Frank's banter. 1. Ideally ears shall be tilted back at an angle to where the screws align closely with the rear angle of the trap located above the rear of the brow. 5. Minimal (or no) gap is preffered between the top of the shoulder bell and the shoulder bridge. Additionally for L3 I'd like to suggest the fall or angle of the tube stripes be correct as seen below, not sure about the wording for this. As we see in these images the tube stripes fall / angle forward from the top and many point this out in applications. many struggle with assembly of ears on helmets so this may not be achievable for some. Yes reaching Centurion should take some effort but making sure most armor is able to reach a specific goal doesn't hurt, AM was just one that didn't out of all other makes. I don't feel we should be enforcing the exact angle of the ear or brow height at anything less than Centurion. The suggestion I made for the ear angle was indeed for Centurion level, "... I am proposing the following changes to the CRLs for ANH Stunt and ANH Hero for level 3. " I suggested this so that those in the build process would have more of a guideline to work from during a build, rather than have to try to fix it afterward.
. Ideally ears shall be tilted back at an angle to where the screws align closely with the rear angle of the trap located above the rear of the brow. As the "Tube Stripe Sheriff", I'm pleased to see hat this is catching on. My concern would be, not all 'generic' tube stripe templates account for the 'lean'. 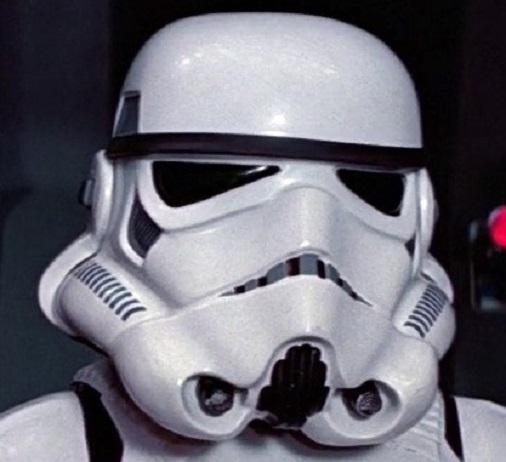 As an example, unbeknownst to me at the time, the templates that came with my trooping lid (not the one in the link) were pretty generic and could have been used on either cheek. I now know that this template was less accurate and would do it differently in the future (as I've learned a heck of a lot more in the last 18 months). As here, the Dave M style templates account for this lean but are commonly applied backwards. In this case, it is very obvious to the trained eye that they are backwards. In summary, I would continue to 'suggest' this to EIB and L3 applicants, however unless all members purchase the exact same templates this would be hard to enforce. 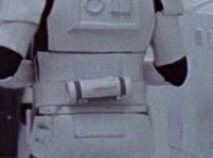 I get what you're saying, however, I personally feel that the iconic look of the ANH Stunt TK is changed when the brow is touching the eyes. Yes, it might only be 5mm, however, it makes a huge difference. There will always be those who critique every millimeter of a suit…and everything else…to death. 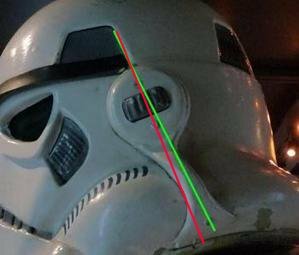 “Screen accurate” is ideal, but to which stormtrooper in all the footage to we emulate? We’ve all seen the perfect standing still armour shots, the open calf armour during action shots, at least one had no brow trim, various gaps in brow trim and so on and so on. The word ‘Ideally’ is by far the most fair wording in some cases. Some will always strive and achieve the absolute pinnacle of perfection and others will only ever be able to get close. Perhaps it it would be acceptable to incorporate levels, or degrees, to the centurion level. L1, L2, L3 so to speak. We already have levels, though. EIB and Centurion are optional programs. Nobody here at FISD is knocking on basic Legion standards, and if people choose to stop there they are more than welcome to. 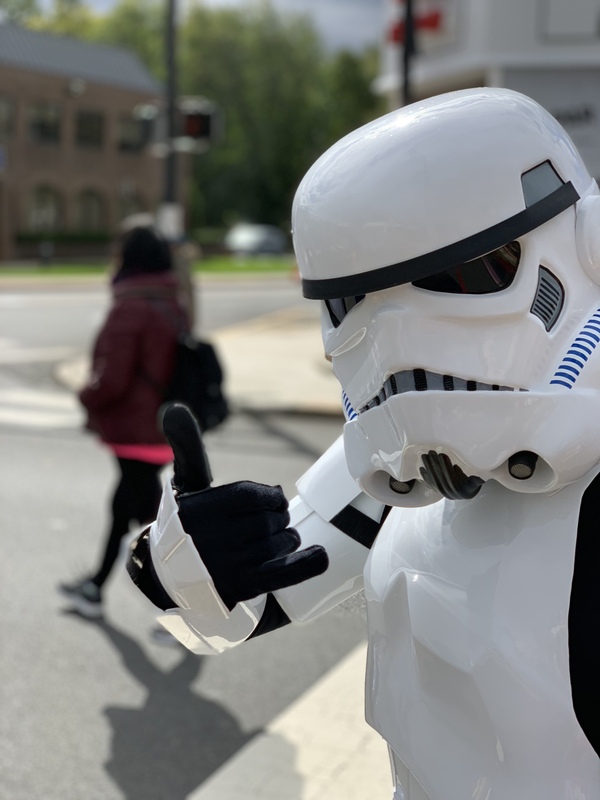 Trooping is what really matters, after all. EI is meant as a upgrade over basic Legion approval, but still leaves a lot of leeway. Centurion was added later for those who wanted something closer to screen accurate and as such, I personally see no problem with added most of these suggestions. I think making people work for Centurion is a good thing - as so long as the requirements are easily backed up by reference images. Many times the angle of the picture / lens / whatever can make things look very different. I think basic and EIB are good as is for the most part (I always thought s-trim and rubber hand guards should be EIB, but that is me). Anyway, not my point here - what I like is the idea of listing more items as "ideal". I think more things like this should be part of the CRL. For example - the ear screws may not need to line up with the trap, but ideally they should. This gives the builder a good guide of what to strive for - not getting it absolutely perfect will not affect their Centurion approval - but it is the ideal goal. The more of this guidance right in the CRL, the better, IMO. We are, after all, judging someone's work based on a few digital pictures - we can't always be sure down to the mm. Well, unless your name is Dan. I'm on board with the tube stripe direction requirement. Another thing to keep in mind - people will get discouraged if Centurion is a moving target. I've seen a bit of this in other detachments. Centurion requirements need to be well defined (which they are, until people start piping up about what is "ideal" and confuses applicants), but also somewhat static and predictable. I'm not saying that changes can't be made, I just think changes should happen on a regular schedule - like once a year at a certain date. Proposed changes should be in the CRL as "ideal" or "proposed" standards for a few months. This is so someone starting a build will know what is expected from them in 2 or 3 months time when they are actually finished and applying for upper level approval. I think we have to bare in mind too that not everyone has the ideal shape and size, I know I'd prefer not to have any gaps around my knees, my elbows or shoulders but those are dictated by my height and my armor and there's not much I can do about it unless I was to try purchase a few longer pieces from another kit which may fit my size but may not match the colour of my original armor. My size is the reason that although I was the first TLJ-E approved my photos where not used in the CRL because of gaps around my knees and there was another applicant at the same time who didn't have those gaps so his where the preferred photos. Was I a little offended by this YES and I don't think many wouldn't, but if you make a level not achievable because of someone's size then I think you are excluding a lot of people.